On March 31 at approximately 3:40 p.m., Calcasieu Parish Sheriff’s Office deputies were dispatched to a burglary in progress at a home on North Ledoux Road in Lake Charles. While en route, deputies were advised by the complainant that when she arrived home she observed a man inside her home, who then took off running out the back door. The complainant also stated a neighbor observed the man get into a truck that was parked near the home and head eastbound on Mark Lebleu Road in Iowa. The witness was able to give a description of the truck and CPSO Dispatch put out a BOLO (Be On The Lookout). A short time later a detective spotted the truck at a nearby convenience store and observed a man, later identified as Edward M. Munoz, 21, Laredo, Texas, walking towards the store. When the detective attempted to make contact with Munoz he fled on foot into the wooded area near the store. After a short foot pursuit Munoz was apprehended and detained. Deputies recovered three $2 bills on Munoz, that had been stolen from the residence. They also located three shotguns and a partially burned cigarette containing suspected marijuana inside the truck. After further investigation deputies learned another man, identified as Jose E. Delgado, 22, Austin, Texas, was also involved. It was learned that Delgado had fled the residence on foot after the burglary. 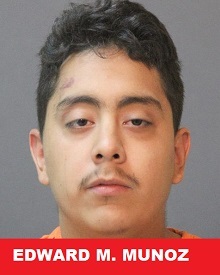 Later the same evening deputies located Delgado walking down Mark Lebleu Road in Iowa. Upon further investigation of the crime scene deputies discovered a bedroom window was broken and used as entry into the home. Deputies also recovered several coins outside near the home that had been taken during the burglary. Munoz and Delgado were both arrested and booked into the Calcasieu Correctional Center. Munoz is charged with simple burglary of an inhabited dwelling; theft under $750; criminal damage to property; resisting an officer; possession of marijuana; and illegal possession of a firearm by a convicted felon. Judge Ron Ware set his bond at $38,000. Delgado is charged with simple burglary of an inhabited dwelling; theft under $750; criminal damage to property; and possession of marijuana. Judge Ron Ware set his bond at $17,750. 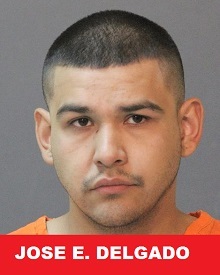 Delgado is currently wanted in Texas on unrelated charges of felony larceny and is awaiting extradition. The recovered items were returned to the victim.